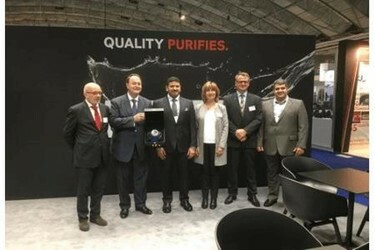 The Liquid Purification Technologies (LPT) business unit of specialty chemicals company LANXESS, one of the world’s leading suppliers of water treatment products and solutions, is looking to expand its business with reverse osmosis membrane elements in Saudi Arabia. On November 1, 2017, it signed a distribution agreement for Lewabrane membrane elements with Riyadh-based Saudi company Industrial and Chemicals Supplies Co. Ltd. (ICSCO). The contract was signed by head of LPT Jean-Marc Vesselle and ICSCO CEO Ahmed Mohamed Gashlan. “We selected ICSCO because of its experience in the field of reverse osmosis technology and are aiming to work together to ensure further growth in this region,” says Vesselle. “Our customers are owners of water and wastewater treatment facilities who are looking for quality, integrity and sustainability. LANXESS membrane elements meet the highest German and international production and quality standards, which makes them the perfect addition to our portfolio,” remarks Gashlan. Industrial and Chemicals Supplies Co. Ltd. is a subsidiary of AlKawther Industries Co. Ltd., which is headquartered in Jeddah, Saudi Arabia. This global company has over 40 years of experience as a distribution partner for the water industry and is a leading supplier of reverse osmosis membranes, ion exchange resins, water treatment chemicals, metering pumps, filtration media, softening plants and monitoring equipment. The Gulf States obtain some 20 million cubic meters of drinking water from the sea every day. In Saudi Arabia, 70 percent of drinking water already comes from the Arabian Gulf and the Red Sea. An energy-intensive multi-stage flash evaporation process is used for the majority of seawater desalination. Pre-treated seawater flows through chambers and evaporates instantly when hot steam is fed in through huge pipe networks. Around 10 kilowatt hours (kWh) of energy is required for each cubic meter of water, which is equivalent to the energy content of one liter of heating oil. Saudi Arabia alone produces four million cubic meters (four billion liters) of fresh water per day in this way. A more economical technology is reverse osmosis (RO), which involves forcing the seawater through semi-permeable membranes under high pressure. These membranes do not allow the salt to pass through. The process only requires around a sixth of the energy consumed by an evaporation plant. The Saline Water Conversion Corporation (SWCC) founded within Saudi Arabia’s Ministry of Agriculture and Water in 1972 estimates that the supply capacity needs to be increased to 10 million cubic meters by 2025 to satisfy the demand of the country and its fast-growing population. This means doubling the water capacity in less than 10 years. “In view of the situation, expanding our business in the region with a distribution partner that has been established there for decades is a key step for further growth,” underlines Vesselle. The high-performance membrane elements in the Lewabrane range consist of spirally wound thin-film composite membranes that were developed specifically for industrial water treatment. Depending on the intensity of use, these elements can produce virtually salt-free water for a period of many years. The special membrane chemistry and the structure of the components ensure optimized, cost-efficient operation in downstream process stages, for example in single or mixed-bed filter circuits. Detailed information about products from the LPT business unit can be obtained online at http://lpt.lanxess.com/en/home/. LANXESS’s Liquid Purification Technologies business unit currently employs over 500 people worldwide and is part of the company’s Performance Chemicals segment, which generated sales of EUR 2.1 billion in 2016.